Hayes & Yeading United were today, for the first time this season, left shell shocked at Church Road as Rushden & Diamonds came to Middlesex and romped home to Northamptonshire with a five goal victory that just about sums up United's form in the past couple of weeks. Diamonds started quickly and Simon Overland was needed after just 58 seconds when Curtis Osano picked out former Yeading striker Jefferson Louis who saw his header touched around the post only for a goal-kick to be awarded. The lead was only a couple of minutes away though as a swift break saw Adam Green miss his tackle which allowed Louis to break into the area on the left, his low centre somehow being turned into his own net by skipper Tom Cadmore who had slid in to clear. 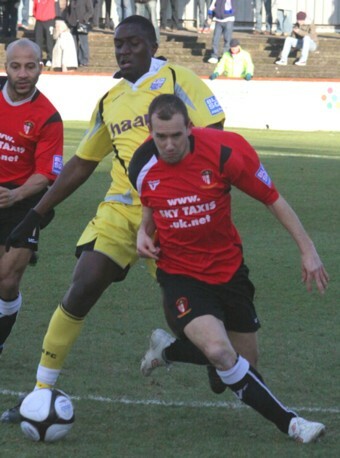 United almost served a perfect reply when Steve Basham helped on a Green free-kick to Craig Watkins but his shot was tipped wide by Dale Roberts in the Rushden goal. 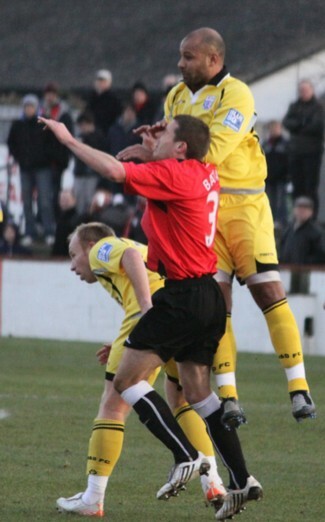 This was somewhat of a false dawn for United as Rushden then began to get a grip on proceedings. Osano fired a free-kick from halfway into the United area, Mark Byrne rose highest but could not keep his effort down. Minutes later the visitors advantage was doubled when Lee Tomlin was given far too much space and time on the left of the area which allowed him to place a perfect chip shot above Overland's fingers and into the far corner of the net. James Mulley had a good chance to pull one back shortly after when Basham played him in but his weak effort was easily gathered by Roberts. Rushden were soon on the attack again and Louis flicked on to a running Aaron O'Connor but he was met by an equally spritely Overland who raced out to block away his shot. Still Rushden pressed for a third, Kurt Robinson moved swiftly past Danny Allen-Page before Matt Ruby deflected his shot wide and then Osano crossed to Louis who saw his goalbound header well defended by Cadmore with Overland mopping up. Number three came in stoppage time as a corner from the left was met six yards out by O'Connor who rose to head powerfully past Overland. Rushden started the second in similar fashion to the first and with just two minutes played a strong tackle on the edge of their won box led to Louis breaking away at pace from his own half only to be denied inside the area by a strong one handed Overland stop. The fourth soon arrived and once again the final touch came from a United man as Basham rose to defend a free-kick only for his touch to take the ball above Overland and into the roof of his own net. Traffic was still in the main only going one way, a long punt to a suspiciously offside looking Louis saw the striker blaze over before a half chance at the other end saw Basham get his head to a Marc Canham free-kick but Roberts swept up with ease. 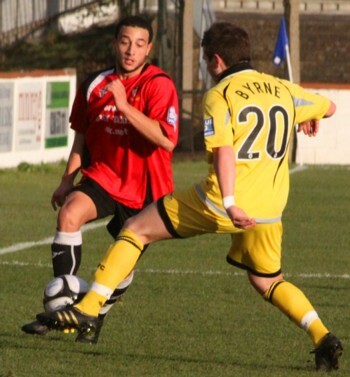 Two more Rushden goals in a five minute spell saw United facing a record defeat as the lead advanced to six. Simon Downer played a free-kick into the United area that substitute Craig Farrell controlled and fired home on the turn and minutes later the same player hit a shot on the run from 20 yards that nestled in the bottom corner of Overland's net. Ten minutes from time the defeat was reduced to record equalling as opposed to record breaking when a lofted ball was inadvertently helped on by defender Downer and Scott Fitzgerald was first to the ball, placing a precise lob over Roberts and into the Diamonds net. United had a couple more chances to further reduce the arrears, almost immediately from the re-start Fitzgerald charged down a clearance from Jamie Stuart but his shot from 25 yards was held by Roberts. Next came a Canham touch at a free-kick and a strike from Cadmore that Roberts spilled but was quick enough to grasp at the foot of his post. As if the result was not bad enough, a stoppage time clash of heads saw on-loan striker Basham stretchered off in a neck brace with the club doctor in attendance.